Scrub the mussels clean under the cold tap and discard any that are damaged. Give a sharp tap to any that are open and if they refuse to close, throw them out. Pull away the beards and set aside in a colander. Strip the coriander leaves from their stems and set aside. Finely slice the stems. Heat the oil in a wide saucepan over a moderate heat. Fry the chilli, garlic, lemon grass and coriander stems for 1 minute. Add the lime leaves and sake, simmer for 2 minutes, then increase the heat. Tip in a single layer of mussels and cover for a minute or two. 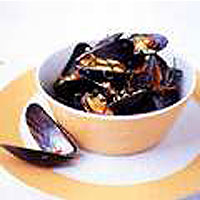 As soon as the mussels open, quickly remove to a large bowl. Cover and keep warm while you repeat the process with the remaining mussels. Discard any mussels that don't open fully. Once all are cooked, check the liquid in the pan. If it contains fine sand, strain through muslin and return to a small saucepan. Return to the boil and whisk in the butter so that it forms an emulsion. Divide the mussels between 4 soup bowls. Pour over the spicy juices, scatter with coriander leaves and serve immediately.